Synopsis: In the 1980s, a powerful artistic movement was born in Singapore, flourishing amongst the Mandarin-speaking community throughout the island and beyond our shores, leaving an indelible mark on the culture of a young nation. 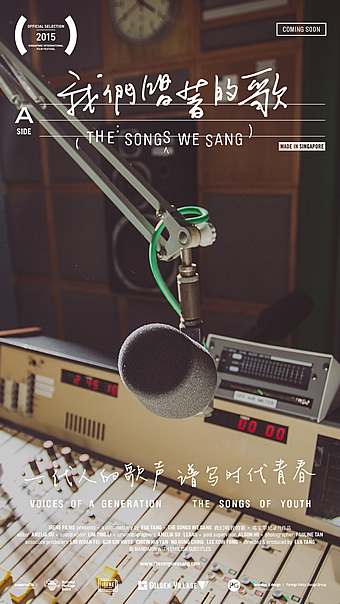 The Songs We Sang, a documentary by Singapore filmmaker Eva Tang, is a vivid and in-depth look into the journey of xinyao (literally “songs of Singapore” in Mandarin) since its birth. Steeped in history and authenticity, this detailed documentary captures the spirit of a Singapore culture that has since become a significant part of a nation’s collective cultural heritage. Xinyao emerged from the hearts of students across campuses in Singapore, and soon found its way into the heartlands, capturing the attention of a nation with its tuneful melodies and elegant and meaningful lyrics about family, friendship and everyday life. Taking its title from a pivotal seminar on xinyao held by the Mandarin student publication Nanyang Students in 1982, The Songs We Sang is infused with the energy, enthusiasm and creative courage of xinyao and its artists, and looks towards future generations of artists who will colour Singapore’s cultural tapestry. This is a true blue Singaporean film that we are really, really proud of. Being a local Chinese born in the 1980s, this reviewer had the privilege to get a glimpse of the pure form of xinyao. The term, literally meaning “Singapore songs”, is a termed aptly coined for the grassroots movement where hopeful young locals wrote and sang their own songs. Yes, before Kit Chan, Stefanie Sun, JJ Lin, the local Mandopop scene was much alive, albeit less glittery and commercialised. Yes, there was a time when people made music for the love of the art, and not with the hope of being talent spotted by performing in hipster bars and pubs. Yes, there was a time when we were less complicated people, when ideals could materialise if you are willing to go the distance. Sounds too warm and fuzzy for comfort in this day and age where practical concerns take precedence over living life? It’s heartening to know the campus music movement known as xinyao did exist in the 1980s – but how much do you now about its association with the closing of Nanyang University, and the end of Chinese as a formal language of instruction in educational institutions? Eva Tang, who is better known for her work on short films like Old Places (2010) and Old Romances (2012), gives viewers a deeper understanding of the xinyao movement with this highly recommended local documentary. She features well known personalities like Liang Wern Fook, Billy Koh and Eric Moo, and also candid interviews with lesser known but equally noteworthy industry players like Dawn Gan, Xu Nan Sheng and Lim Cher Hui. The latter group of interviewees should not be unfamiliar faces for those who grew up in the 1980s. And that is the magic of this 128 minute documentary. One can imagine that putting this film together is a logistical nightmare, considering the arrangements, scheduling and music copyrights clearances that are in the way of the filmmakers. Plus, wait till you see the amount of rare and precious archival materials in the film. Yet, you can feel the passion of each and every crew member behind the scenes. In front of the camera, you also feel that every interviewee wants this story to be heard. In fact, after the movie’s only sold out session at last year’s Singapore International Film Festival, it was unknown whether there will be a commercial screening. Fortunately, the production supported by the National Heritage Board has found its way into cinemas here, fighting the box office battle alongside Hollywood blockbusters. What we knew about xinyao may be from the recent Channel 8 drama Crescendo, as well as 2013’s The Girl in Pinafore directed by Chai Yee Wei. This documentary gives you the real deal, as you get to hear from the folks who were personally involved in the landmark movement that has paved way for the Singapore’s pop industry. Through the many personal anecdotes (plus scenes captured from the one off concert at Bras Basah Complex in 2014), it is heartwarming to see how people came together before xinyao eventually took on a life of its own – a fact of life that proves that if there’s something you truly believed in, pursuing it will only bring about fruits of labour.